One of the greatest things in Austria, in my oppinion is food. Due to Austrias history a lot of dishes from countries all over Central Europe have been incorporated and adapted a lot of regional dishes from Italy, Bohemia, Hungary and other countries into the Austrian Cuisine. I want to start a new “series” in this blog where I will introduce you to a lot of Austrian Food. I will start today with some soups, that you will find in almost every Austrian restaurant. Frittaten-Suppe: this is a beef soup, which has stripes of pancakes in it. Tiroler-Knödel-Suppe: this is a beef soup with dumplings made out of bread and bacon (Speck) in it. 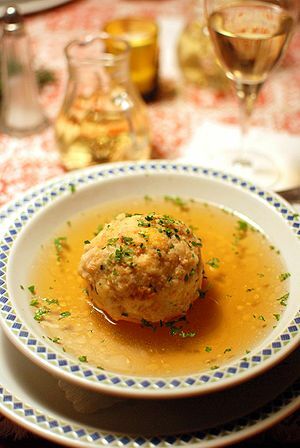 The tyroleans therefore call it Speck-Knödel-Suppe, but the more reknown name is Tiroler Knödel Suppe. Leber-Knödel-Suppe: this is a beef soup with dumplings with Liver in it. You might also get it as Leber-Spätzle-Suppe, with way smaller dumplings in it. For some reason I love the Knödel but cannot stand the Spätzle, but I guess thats just me. Griessnockerl-Suppe: another beef soup – this time with small dumplings made of Semolina. An absolut classic, which I stronly recommend. Wiener Festtagssuppe: another beef soup, which can be taken as a main course, too. It has noodles, some pieces of beef and some vegetables in it. Gulasch-Suppe (Goulash soup): this soup bases on the hungarian Gyulas: its a thick soup with meat and peppers. Do not mix that one up with Gulasch – which is a main course and kind of a stew. Gulasch-Suppe is a highlight on long nights out and you often get it in Bars that have open until late, as it revives you, if you had a drink to much. Kürbis-Creme-Suppe (Pumpkin Soup): this is a cream soup made out of pumpkins; it is served with some pumpkin seeds and some pumpkin-seed-oil in it. This speciality of Styria is getting more and more popular all over Austria. Spargelcreme-Suppe (Aspargus Soup): this soup is made out of Aspargus – pieces of it do cook in the soup and then it is made to a creme soup, but there are also some “whole” pieces of Aspargus on it. This soup is only served in spring. Bergkäse-Suppe (cheese soup): This soup is mainly served in the alpine regions, you will find it in a lot of variations, as every region uses its regional cheeses. A must for Cheese-Lovers. Hm, I am getting hungry now. I hope you like this short introduction into some of the soups of Austria – you will find most of these soups on the menus in restaurants all over Austria. There is also a great variety of regional soups – I might take a look at them at some other time. Next Thursday I will treat you with the most famous “main courses” – for example Wiener Schnitzel.